Miss Anne is once again donning reindeer antlers and a bright red nose for the holiday season! Cruises on the Bay™ by Watermark® is proud to announce Jolly Express Cruises for the 2012 holiday season. 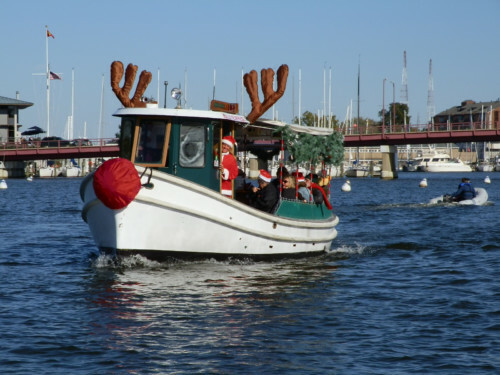 Jolly passengers will enjoy hot cocoa, holiday music and lots of holiday cheer on a spirited 45-minute cruise of beautiful Spa Creek in Annapolis. Taking place in the evening, Jolly Express Cruise passengers will have a wonderful view of the sparkle of Annapolis Harbor and waterfront properties along Spa Creek during the holidays. Ten percent of ticket proceeds will be donated to Historic Annapolis. Watermark is also encouraging Spa Creek residents to participate in a contest for “Best Illuminated Property” with two winning prizes of a private Jolly Express Cruise. Watermark invites Spa Creek neighbors to join in the fun for a good cause and a great prize. All Spa Creek waterfront property owners – and those who dock their boat on Spa Creek – are encouraged to decorate their waterfront properties and boats. Cruise passengers on the December 2nd cruises and also on the December 9th cruises will vote on the “Best Illuminated Property” on Spa Creek. One winner will be chosen on each date and each winner will be awarded with a private Jolly Express Cruise for up to 22 passengers. Learn more and read contest rules at www.cruisesonthebay.com/jolly-express-contest. Jolly Express Cruises begin Friday, November 30 and are offered Fridays, Saturdays and Sundays (except December 8) through the end of December plus December 24, 25 and 31. Cruises run at 6, 7, and 8 p.m. Tickets are $22 for Adults and $12 for Children 11 and under. Lap blankets will be available. Advance reservations are recommended. Tickets can be purchased online at www.cruisesonthebay.com or beginning at 5:45 p.m. the day of cruises from Miss Anne’s captain at City Dock. Cruises depart from Miss Anne slip Annapolis City Dock, about halfway down the boardwalk under the lighted “Jolly Express” sign. Private Jolly Express cruises and charters are also available. For more information, call 410- 268-7601 x100.